Turtles’ distinctive, protective shells set them apart from other reptiles. In general, turtles feed on crayfish, dead animals, fish, birds, small mammals, amphibians and aquatic plants and live in marshes, ponds and wetlands. All turtles belong to the order Testudines. Blanding’s turtles have bright yellow chins and throats and smooth, helmet-shaped yellow-speckled shells. They live in quiet waters in wetlands; shallow, vegetated portions of lakes; and wet sedge meadows. They are chiefly carnivorous and eat snails, insects, crayfish and vertebrates. The Blanding’s turtle is a state-endangered species in Illinois, and since 1996, the Forest Preserve District has been working to revitalize the county’s dwindling population. The program was spurred by District studies that discovered that the local population — already suffering from fragmented and reduced wetland habitats — was comprised mainly of older individuals and few juveniles, a bad mix for natural population growth. Through increased knowledge and experience, the District has successfully hatched out 2,336 Blanding's turtles since the program started. In recent years, at least 90 percent of the fertile eggs recovered resulted in hatchlings. In 2013, 204 fertile eggs were collected and hatched, creating an unprecedented 100 percent hatch rate. A large keel runs down the middle of the common map turtle’s olive shell, which has a network of yellow lines that resembles a road map (and gives this turtle its common name). 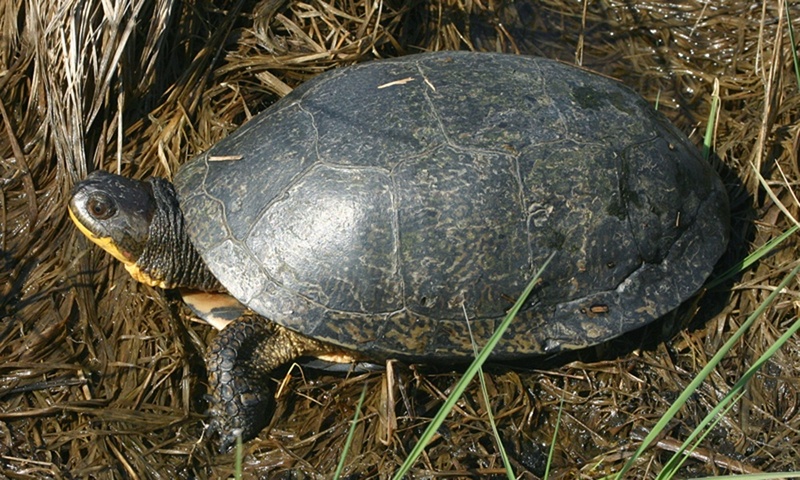 This turtle has triangular yellow marks behind its eyes and stripes down its head. 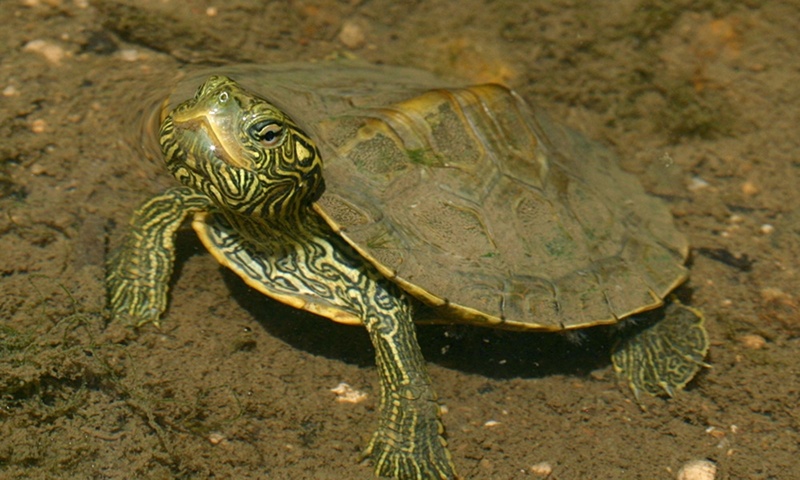 Common map turtles live in the backwaters and slow-moving stretches of rivers and in large mud-bottomed lakes with lush vegetation. They are carnivorous and eat snails, clams, crayfish and insects. The common musk turtle has a plain black to light brown shell and barbels on its chin and throat. Two light stripes run down the sides of its head. It gets its common name from the odoriferous substance it secretes from glands near the edge of its shell to defend itself against predators. Common musk turtles live permanently aquatic lives in mud-bottom habitats of lakes, ponds, swamps and slow-moving rivers. They are omnivores that eat plants, mollusks, insects and worms (often from anglers’ hooks!) by walking on river bottoms instead of swimming. 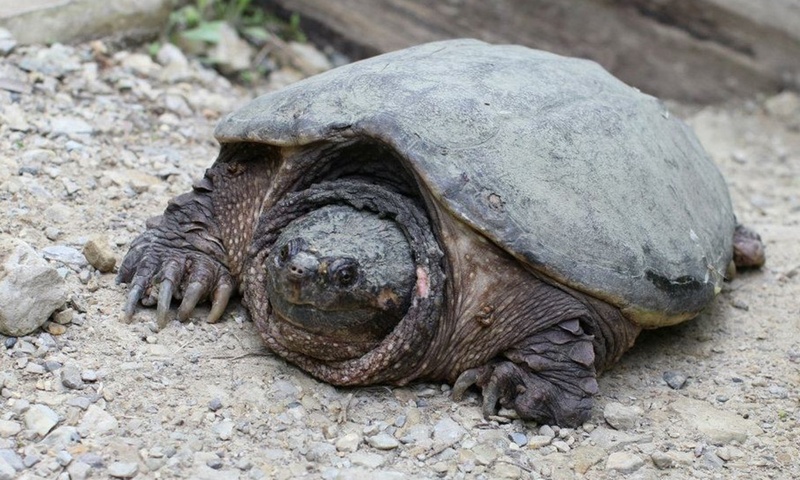 The snapping turtle has a large, long neck; massive head; and powerful, hooked, beaklike jaw. In the wild, it can reach 45 pounds. Its tail is as long as its relatively plain shell, which is brown, olive gray or black. Unlike other turtles, it cannot completely retreat into its shell for protection, but it compensates by having powerful jaws. Snapping turtles can live in most bodies of waters, especially shallow, mud-bottomed backwaters and ponds with aquatic vegetation. They usually lay buried in the mud with their eyes and nostrils exposed. Being omnivores, snappers eat invertebrates, carrion, aquatic plants, fish, birds and small mammals. 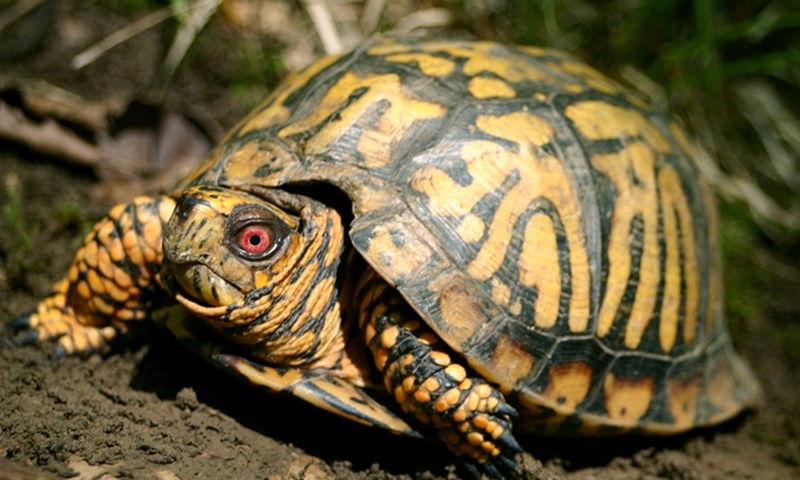 The eastern box turtle has a high domed shell with yellow or orange markings on a dark background. The shell is hinged at the bottom, allowing the animal to close it to escape predators. The eastern box turtle also has a sharp beak. It lives in and along the edges of forests, where it eats berries, fungi, earthworms, snails, slugs and insects. 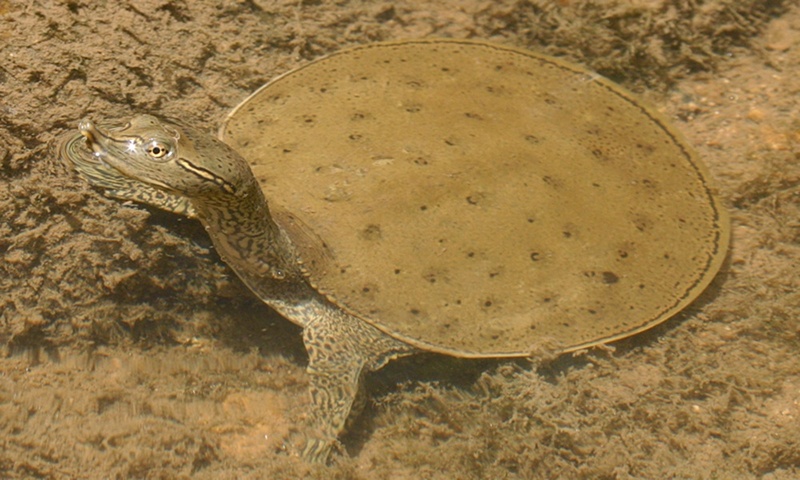 The spiny softshell turtle has a smooth olive shell marked with dark spots. Small spines line the shell near its head. Stripes run from its pointed, squared-off snout to its eyes and its eyes to its neck. Sharp-edged jaws that can inflict painful bites are hidden behind its lips. Spiny softshell turtles live in rivers, backwaters, lakes and ponds. They’re primarily carnivorous and eat aquatic insects, crustaceans and fish. They are “sit-and-wait” predators that bury themselves in the sand or mud and ambush unsuspecting prey that gets too close. 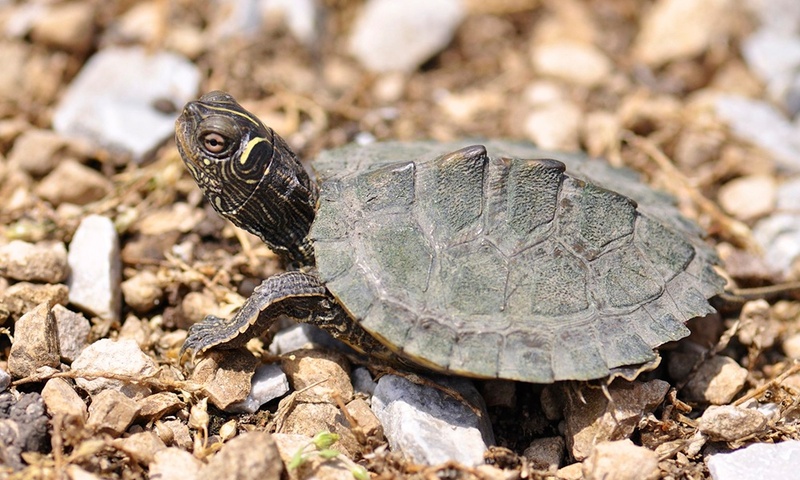 Like the common map turtle, this species has a network of yellow lines on its olive shell, which resembles a road map. It lives in rivers and backwaters near areas where it can bask, although it is skittish and is one of the first turtles to jump in the water if someone approaches. 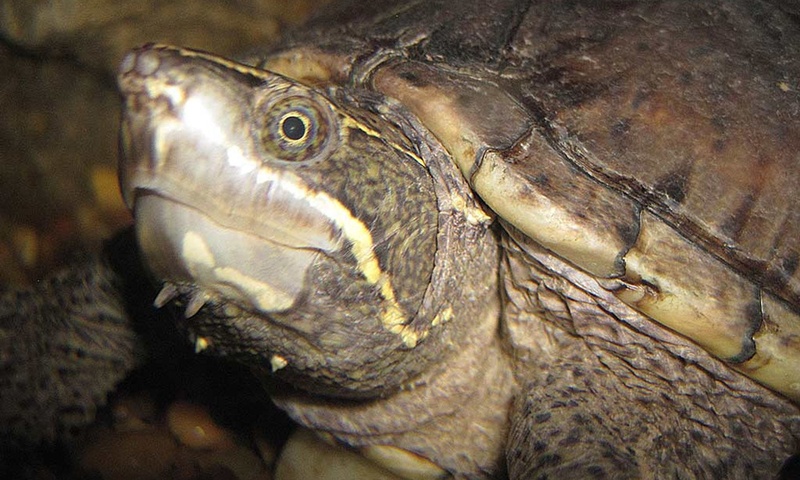 Unlike the more carnivorous common map turtle, the false map turtle eats plants and animals equally. 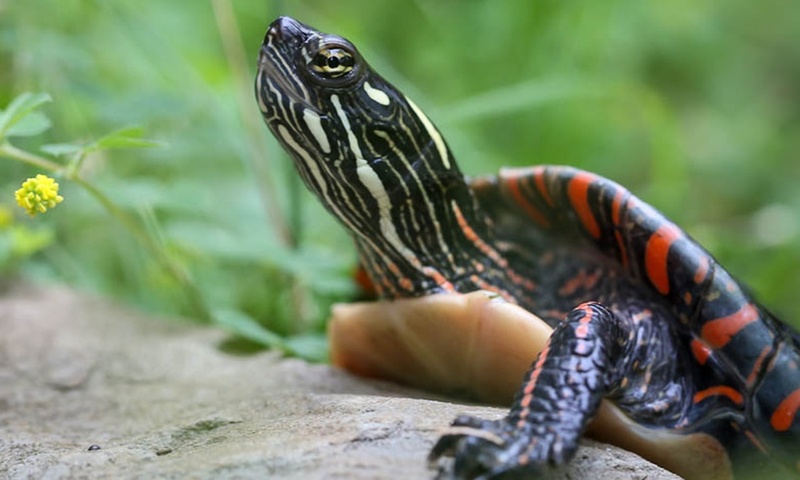 The painted turtle has a fairly smooth top shell that’s black or olive with red markings. Its bottom shell is yellow, red or orange mixed with black. It also has yellow stripes down its head and limbs. This mix of colors gives this turtle its common name. For protection, it may retreat into its shell, urinate, scratch or claw. Painted turtles are highly adaptable and live throughout Illinois in aquatic areas, including ponds, rivers and marshes. They often gather and bask on logs or banks in the summer. They are omnivores that eat plants, insects, mollusks and dead fish.